An evening where we planned to ROLL THROUGH THE AGES ended up with two sessions of THROUGH THE AGES instead. Both (the rare) 1st Edition and (the erroneous) 2nd Edition were in play. Find out the future of THROUGH THE AGES in 2015. This completes a trilogy of gaming sessions that started with Rahdo’s Top Ten Heaviest Games and ended with Vlaada’s Thru the Ages. 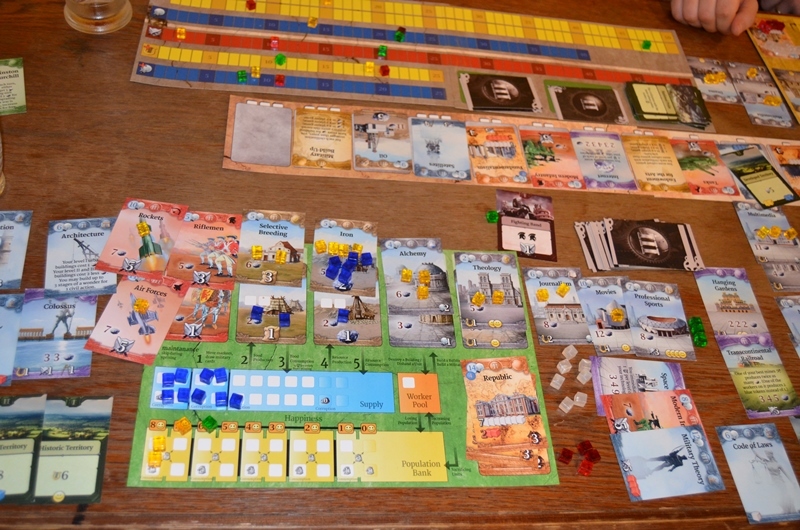 Inspired by a gamer (Christopher John Clancy) who posted a play session of Thru the Ages in Boardgames-to-Go a few days earlier, and Kaz who has been asking me to do a Long Civilization theme nite at OTK so that he can get Thru the Ages and Patchistory sessions, I thought Why Not when we were presented with the opportunity to do back-to-back gaming nites at OTK with Friday being a public holiday (Labour Day). 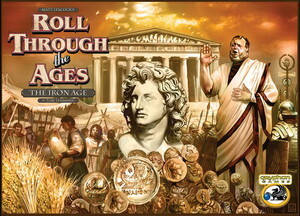 … before proceeding to the main course for the evening which is Vlaada’s epic THROUGH THE AGES (TtA). 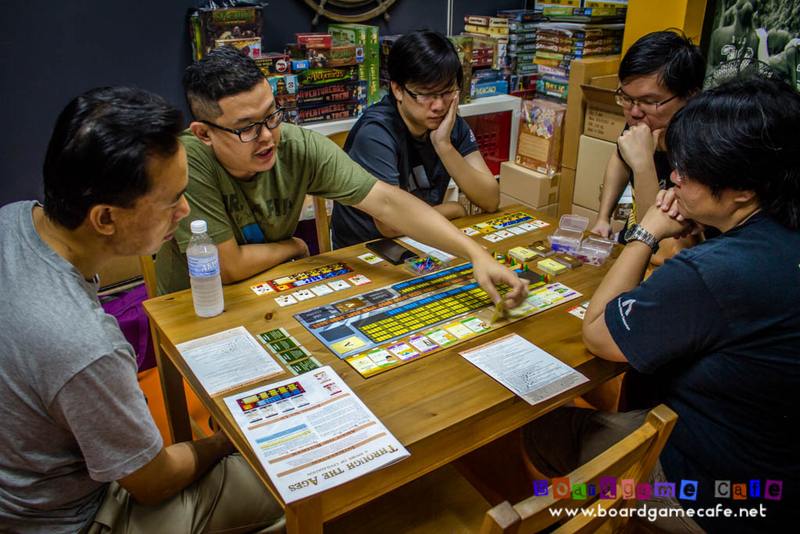 We’d initially thought the much lighter ROLL THRU games can be used as filler while waiting for the gamers to arrive, but alas everyone seemed to have a mind to arrive at the same time! All six of them… which meant we were good to start immediately with 2 sessions of Through the Ages. Our resident TtA expert putting everyone thru a rules refresh… the objective is to run two tables of 3-player Advanced game. We’d wanted to aim for the Full game but thought it was better to dial back to the Advanced game first for everyone to get back to speed with the game flow before setting another date for the Full game possibly in our next LSD session. One would have thought 2-sessions of TtA would simply mean two boards in play. However at OTK, we just tend to do things slightly different. 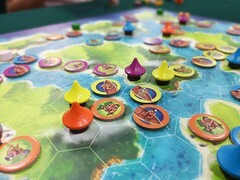 The general game board of the 1st Edition. 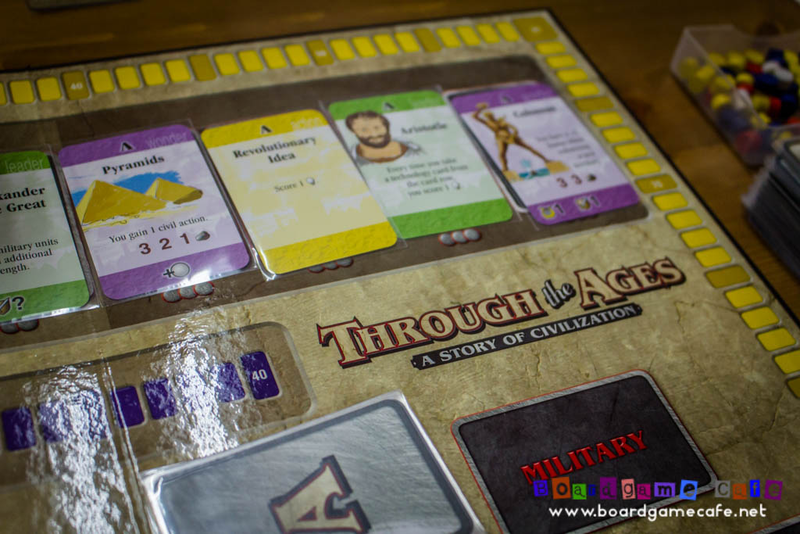 Note there’s no logo / game title “Through the Ages: A Story of Civilization” printed anywhere on the game board. 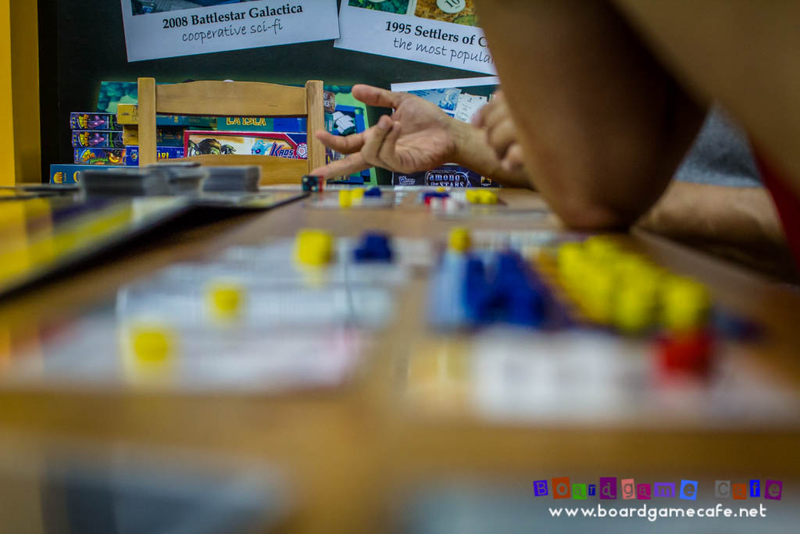 As if Vlaada forget to imprint at the minimal, the game title on the board. Perhaps it was Vlaada’s thinking back then that this is just “another Civ-lite card game”. 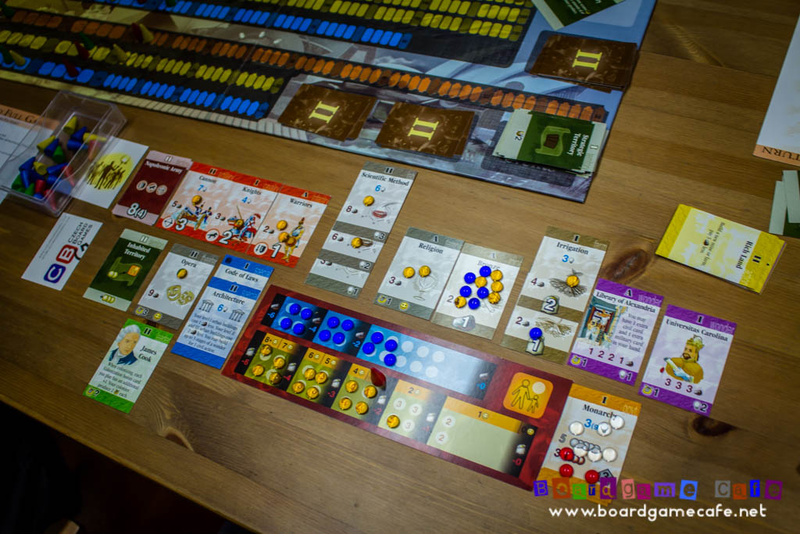 The Culture scoreboard does not loop around the board (as in the 2nd Ed onwards) but instead snakes around in the middle (the yellow spots). 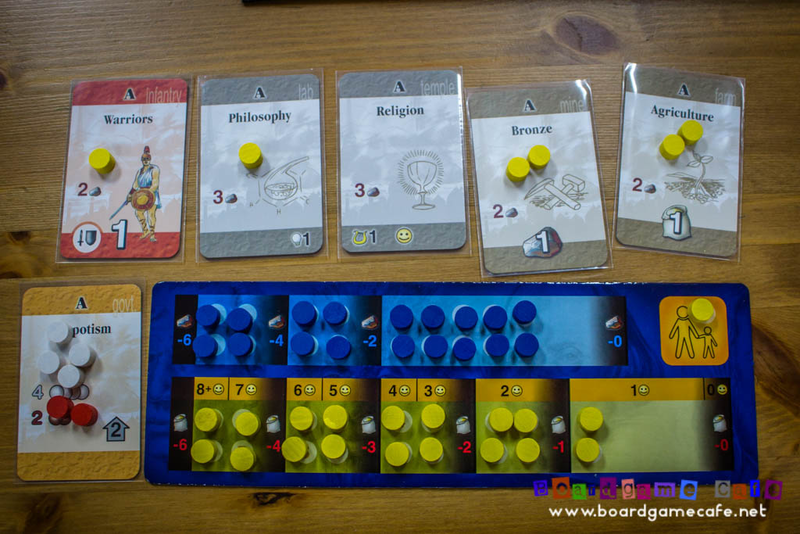 The player board from the 1st Edition. Uses translucent beads (vs wooden discs in other editions). Just as fiddly as the wooden discs in the 2nd edition. Wooden cubes would have been better, no? 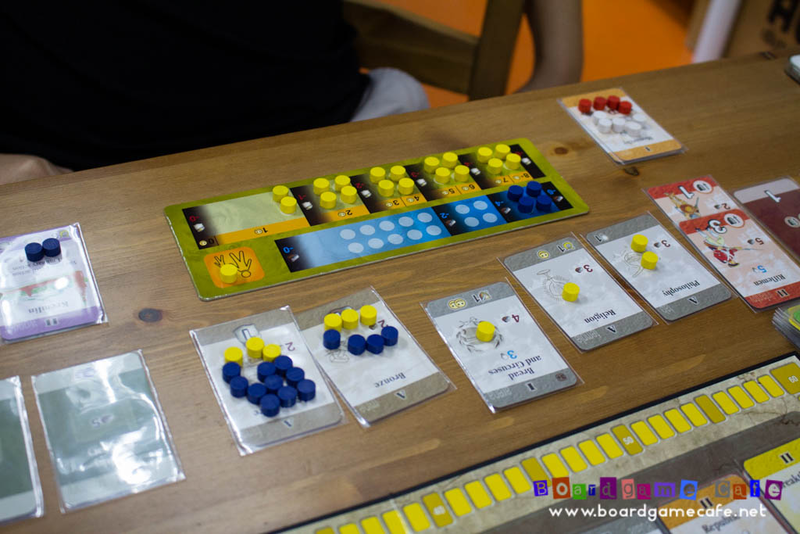 But the translucent beads do make the board looks pretty! Oh, forgot to mention the 1st Edition uses wooden cones as player markers (other editions use wooden cubes). This is the only edition that uses these wooden cones, making them unique across all TtA editions printed. 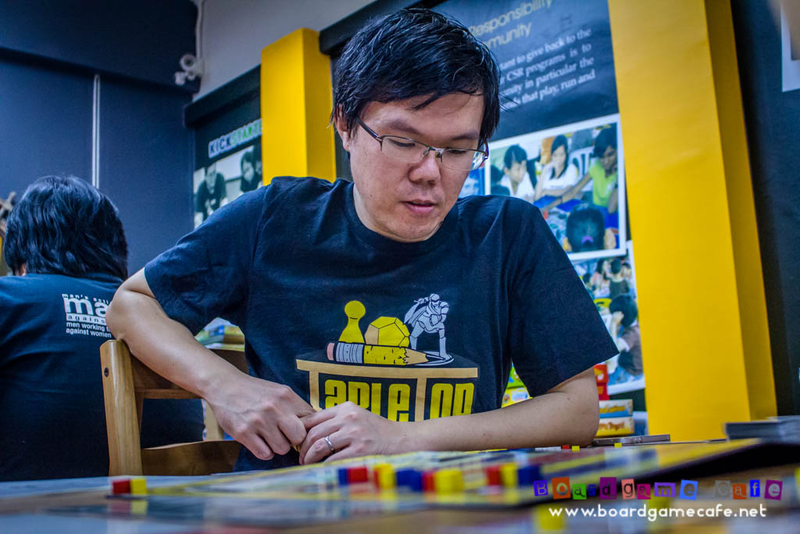 Above: We’ve Kaz, Ivan and Vence playing on the 1st Edition board. Sonia & Meng (two on left) were just observers in this world of Civilization. Observers like these above. I think Meng & Sonia were somehow supposed to dress in this way, but forgot! 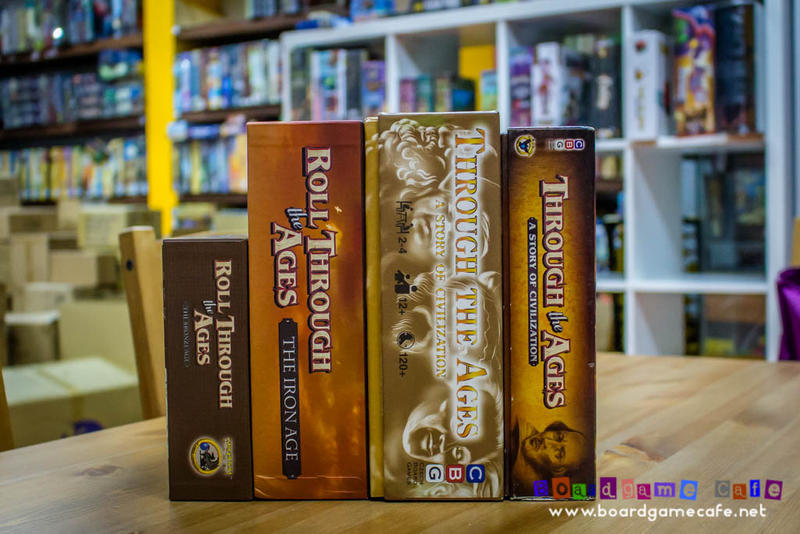 Yours truly was one of the first few in Msia to own a copy of Thru the Ages back in 2007, and unfortunately that has to be the buggy 2nd Edition from Eagle-Gryphon. A patch released by Eagle did resolve some of the issues… but they really should have done a better job back then and not marred this epic game. 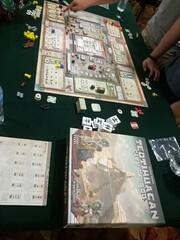 The 2nd Edition general game board. 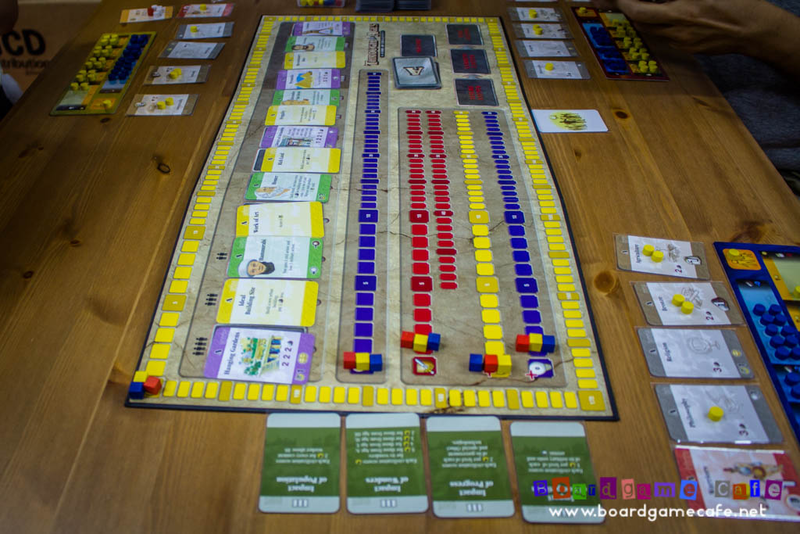 The game title is now printed on the board (at the top middle) and the Culture scoreboard now runs along the edge of the board. One major snafu of this scoreboard – you can’t see it in the pic above – is a bad misprint of the points from 80, missing 90 and continuing to 100. 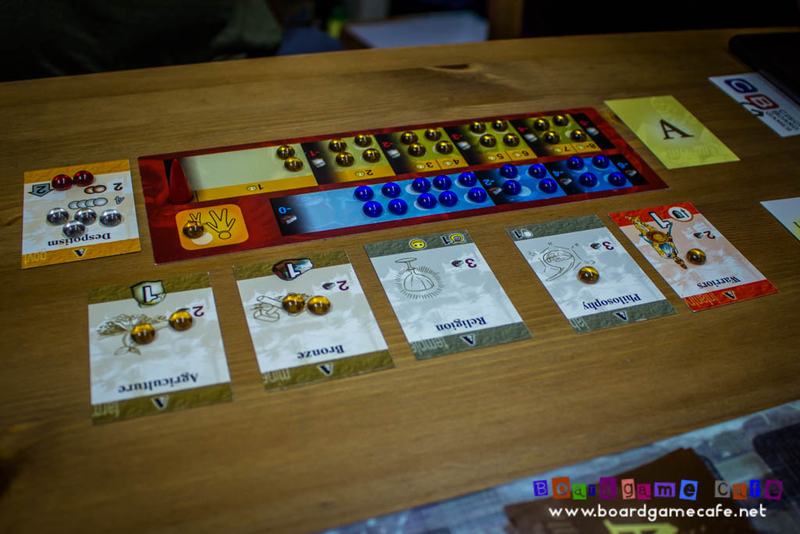 The player board for the 2nd Edition. 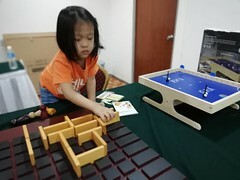 While the round wooden discs are nice components, they are too small to handle and tend to easily “roll away”, making the game more fiddly than it should be. 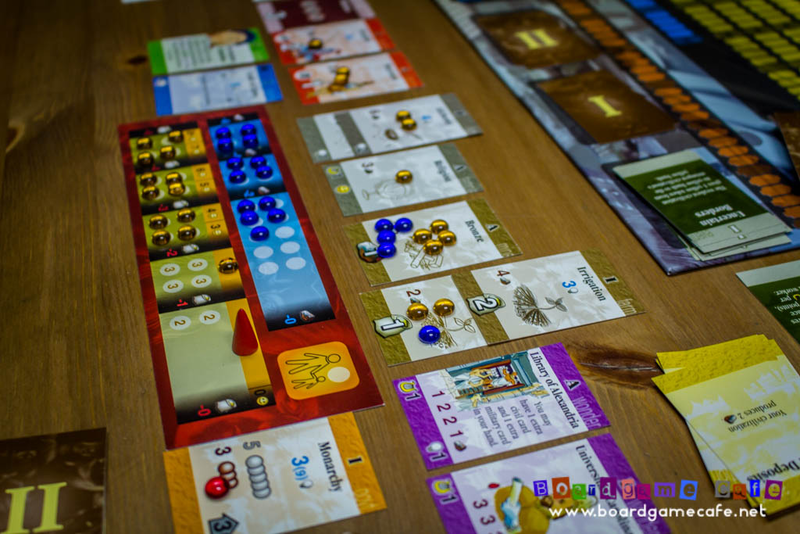 The “Sushi bar” where the cards move along in the 2nd Edition board. 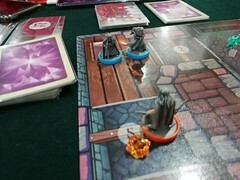 One of the unique mechanics introduced by TtA where the active player gets a wide choice of cards to buy with newer cards costing more civil action points. 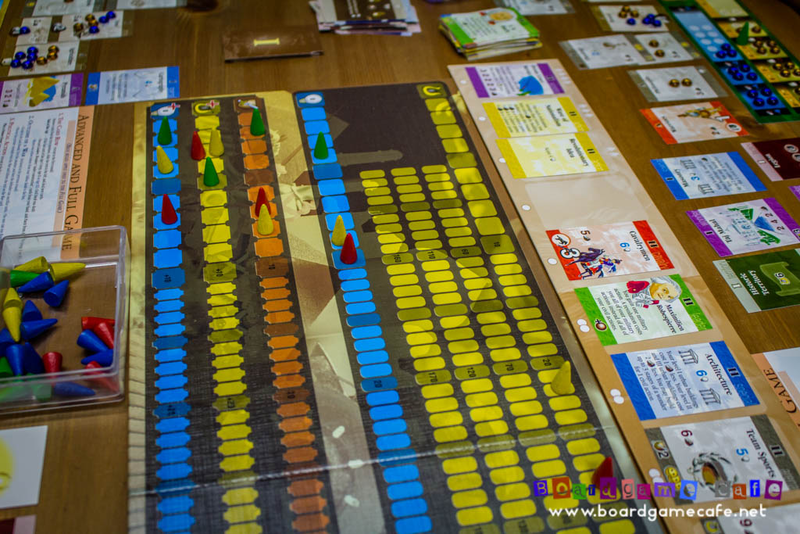 You can also see the title of the game printed on the 2nd Edition board above. 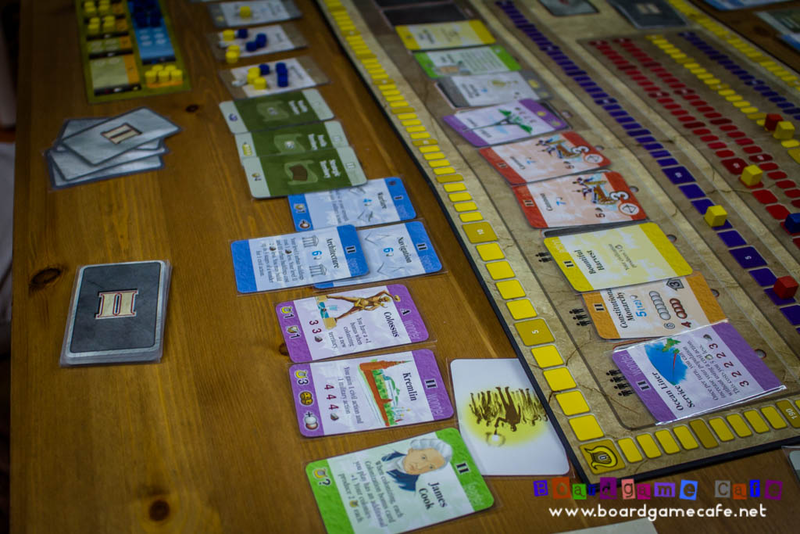 For some reason, the game title was not printed on the 1st Edition board. How did our session go? This Civilization sure ain’t gonna suffer from famine anytime soon…. the abundance of grain!! Heng’s CIV eventually outdid everyone on grain production…. If only there’s a trading market for grain in this game. Grain FTW! We did the Advanced Game and played thru till Age II. It does give one an almost full flavor of the Full game except without going thru the Age III decks, you do lose the Epic feel somewhat. Military while more relevant in the Advanced Game (compared with the Simple Game) is still too meek to make any significant difference. Aanemesis had virtually no military muscle in this session yet he didn’t suffer too badly from it. In the Full Game, you can’t afford to grow your Civ without having military protection. 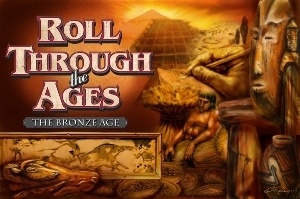 Here’s the complete set of ROLL THROUGH ALL THE AGES games we’d wanted to play today… in the end, we skipped the lighter ROLL THRU games and went straight into two sessions of THRU THE AGES. 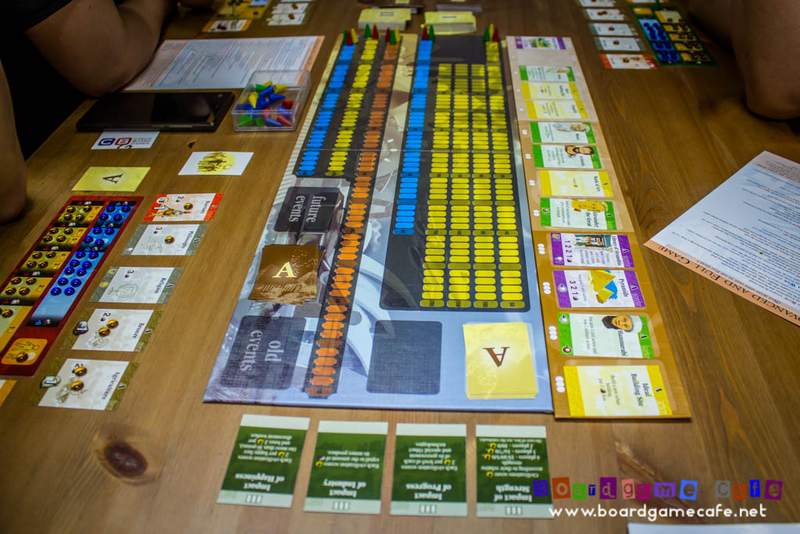 The ROLL THRU series are quite fun so we’ll be hoping to bring them back to our meetup tables soon. 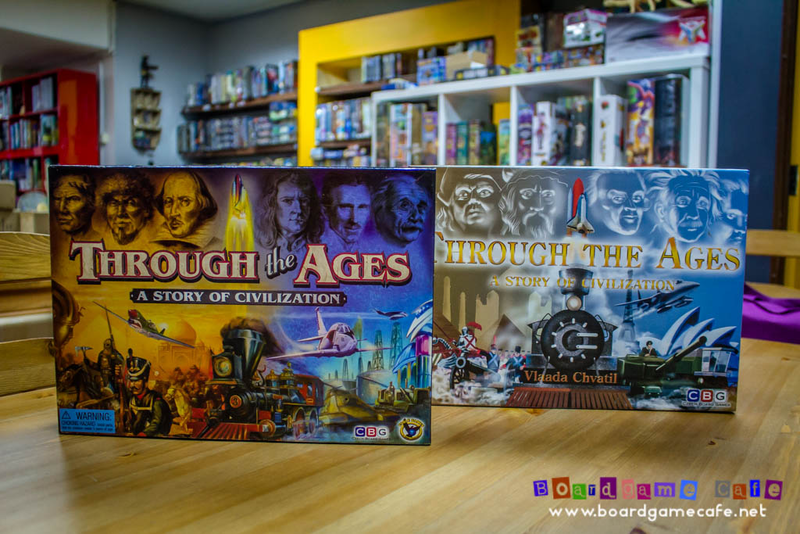 The two editions of THROUGH THE AGES that graced the OTK tables tonite. The left is my 2nd Edition print from Eagle-Gryphon while Kaz’s much-valued 1st Edition is on the right. Since the (buggy) 2nd Edition, there was a 3rd edition released by Eagle-Gryphon with two printings; one done in 2009 and another more recent 2014 (Kickstarter). AFAIK the 2009 3rd edition is sold out, and the Kickstarter edition is not available on retail. 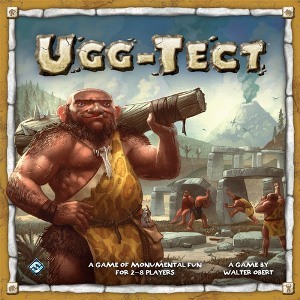 Which brings us to the forthcoming 4th Edition from CGE, announced and planned for Essen 2015. Here’s a snap of the 2015 Edition prototype. I think they’ve made some changes from the above and it’s not just a direct reprint as Vlaada has talked about putting in improvements and enhancement. After all, the game is now almost 10 yrs old. Hopefully the new 4th Edition is ready for Essen this year; as I’m sure Kaz will pick up his copy. 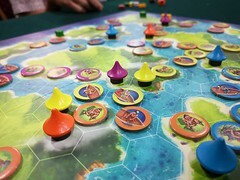 If they are ready for retail, Boardgamecafe.net would have preorders for them too. Stay tune to our Marketplace forum for news. It was great having two sessions of Through the Ages at the same time. Even with 3-player count, the Advanced Game took up to 4 hrs. We’ll still be planning for the longer Full Game sometime soon at OTK, probably in one of our LSD meetups. If you are interested to join our LSD meetups, track our conversation in the forum and participate there; and we hope to see you soon. More pictures of this meetup session from our Facebook photo album. 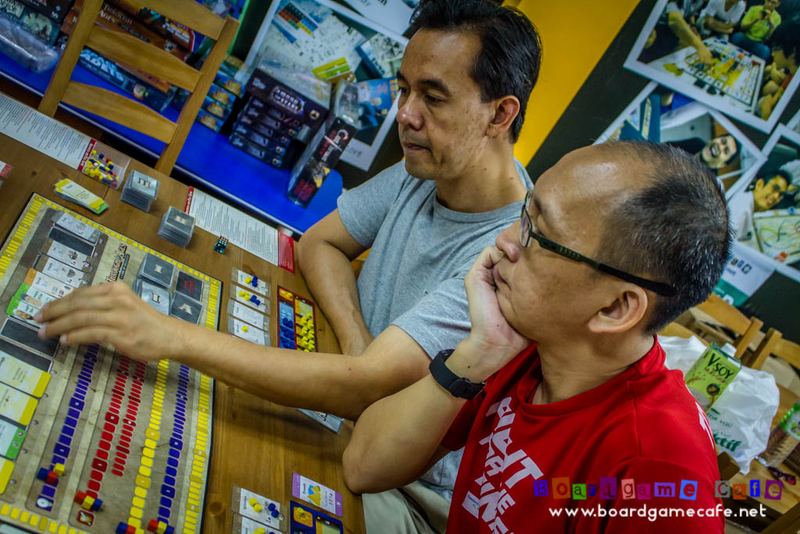 For more photos of boardgaming session, visit our Facebook Album. 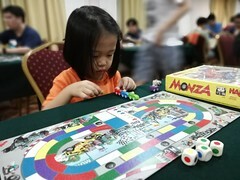 For more boardgaming reports, visit our Boardgamecafe.net Blog. To discuss this gaming session, join us in our Facebook Page. 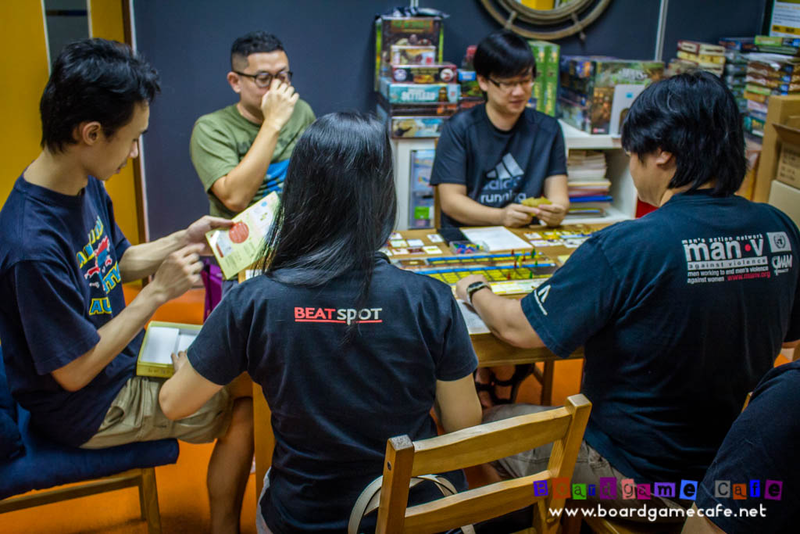 To buy the games played in this meetup, please visit our Web Store. 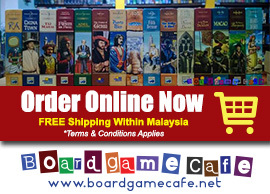 We carry over 1,000+ games and provide prompt and free delivery to anywhere in Malaysia. Min order applies for free delivery. 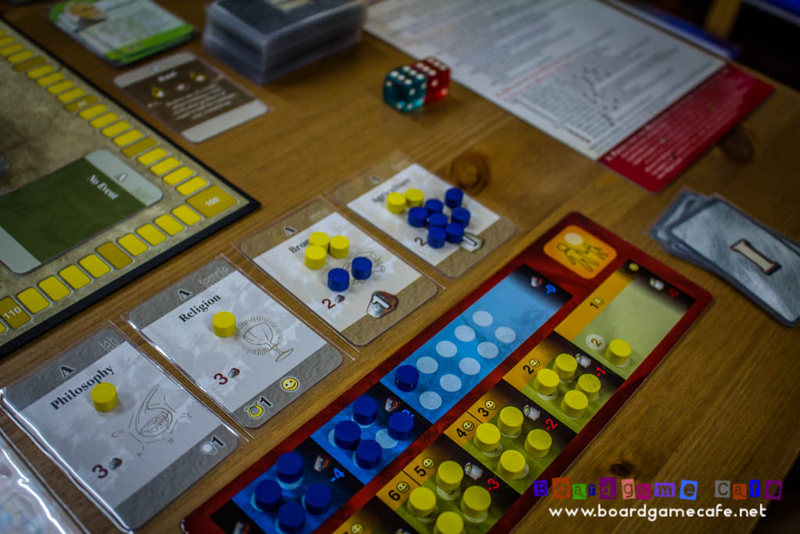 If you are a retail store looking to sell boardgames, you are most welcome to get in touch with us. Find out how you can buy games, earn points and redeem for special promos thru BGC Points.